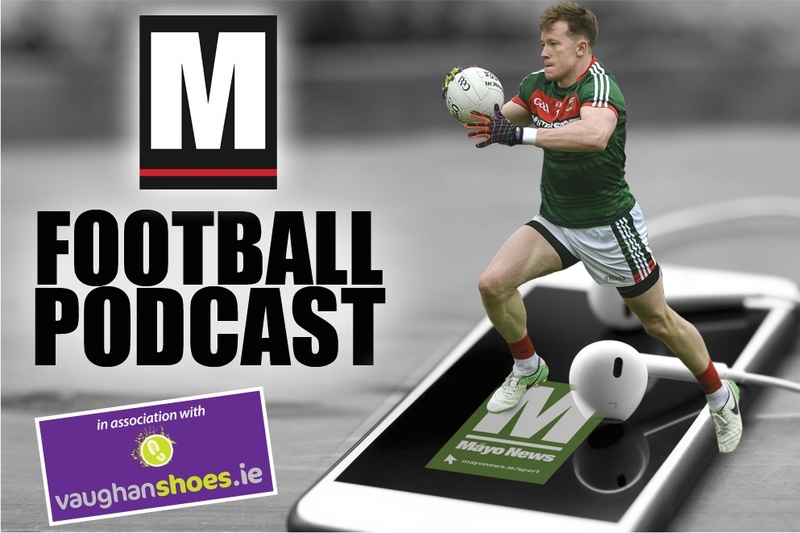 All this year, the Mayo News football podcast is being sponsored by VaughanShoes.ie, a company headed by Mayo footballer Donal Vaughan which has strong roots within the county while also being at the cutting edge of European footwear fashion. 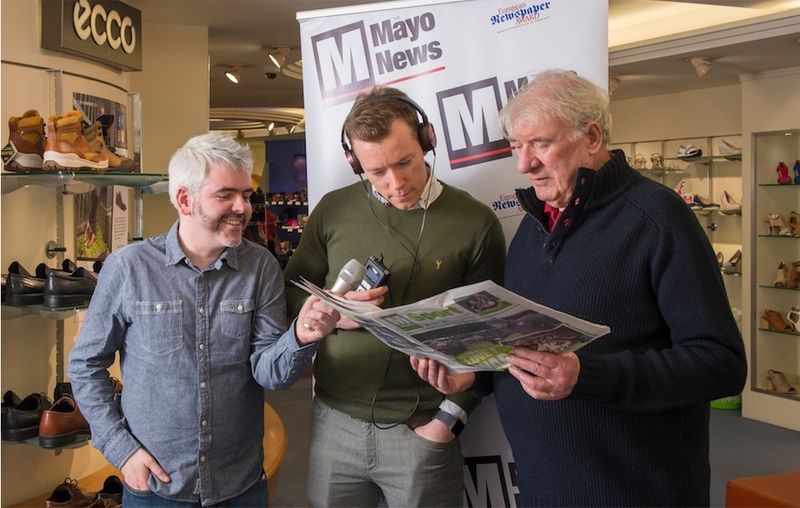 To commemorate the launch of this sponsorship, this week we’ve got a bonus episode of the podcast, the centrepiece of which is an in-depth interview by Mayo News sports editor Mike Finnerty with Donie ‘Shoes’ Vaughan. Currently working his way back to fitness following hip surgery, Donie reflects on Mayo’s form to date in this year’s League campaign and gives his thoughts on what to expect from the team this weekend against Dublin. Donie also looks back at last year’s championship run and talks about the summer campaign to come. Also in this bonus episode host Rob Murphy and Mike Finnerty run through the list of Mayo players currently out of action for one reason or another. Join them to hear about when we can expect to see the likes of Lee Keegan, Chris Barrett, Seamus O’Shea and Donie Vaughan back in the county colours again. 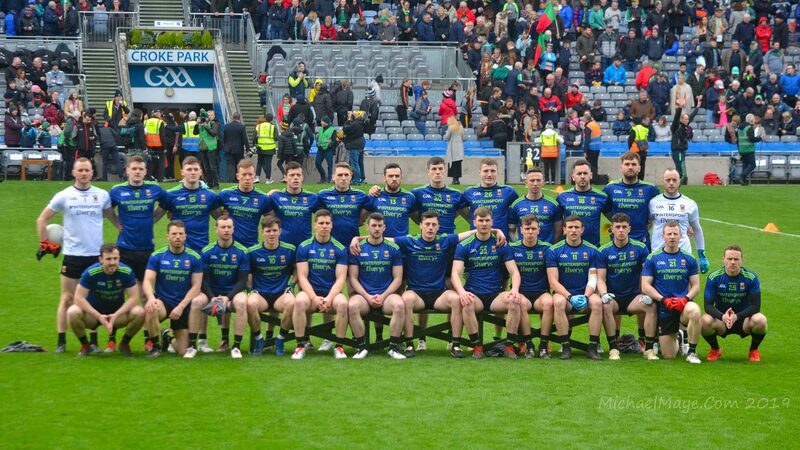 To round off this episode, Mayo News columnist Billy Joe Padden chats with Rob about team tactics ahead of Saturday evening’s clash with League table-toppers Dublin. This latest episode of the podcast – proudly sponsored by VaughanShoes.ie – is now available to listen to on SoundCloud and iTunes. Indeed, you don’t even have to leave the site to listen to it: just click the player below or the one on the sidebar to the right. Enjoy! Hearing that Harrison is also likely to be out with a hip problem for the Dubs game [RTE website] is not good at this time of year. Maybe it’s not longterm but it’s not a good time of the year to be picking up such an injury. There was me thinking that Keith Higgins would – wiith Eoin O’Donoghue’s form – be available to add punch to our attack on his return. May not happen now. I think if there’s any doubt the lads need to persuading Keith to come back well in time to prepare for Galway. I think we need him to win the AI. If we fail to uncover a new attacker then it’s up to Freezer, Loftus, Regan or Gallagher to stand up. Another option for FF is height and Barry more likely to win high ball than Kirby who is a natural scorer but primary possession in there is more important as we know other lads can feed off good ball and score. Half forward breaking ball where we fared poorly enough last 2 games suggests Doherty needs to move out there even if 15 on his back because despite his many attributes Diarmaid doesn’t have the same scavenging instinct. If Cillian fails to make the 15 and I for one think right now he’s borderline a sub rather than starter the Diarmaid can be swapped with Doherty coming out and him going in but given a free role. Nally probably worth looking at some more as he has plenty of football in him, as for his best position I’ve no idea, probably centre half forward. Sure the hurlers will be finished every thing by June. Is Keith going to do nothing for the rest of he season? Of course not. Lots of uncertainty..Too much to be honest..No Keegan,Harrison hip injury could be longer term that the Dublin game tbh..Higgins ..Well the thought of him not making those breaking runs this Summer is just…bleugh..Sad week in Castlebar and the weekend is not going to provide respite I fear..
Keith Higgins will slot back in when he’s ready. I’d say he had his fill of football last year and a break won’t do him any harm at all. Any news on Cillian’s punishment for his indiscretion v Galway? I see on RTE’s website that a Clare player got a two match ban for “colliding” with a Tipp selector the same weekend and I read somewhere that Mayo selector McEntee got two months for his “peaceemaking” efforts that day v Galway. Cillian got a one match because of the red card. Surely that will be all, they cannot look to impose anything else. I think Dave has hit the nail on ye head re keith. The man has probably had his fill playing non stop intercounty football since 2005. If he decides to come back after the hurling at the end of June then brilliant. If he doesn’t best of luck to him. He owes noone nothing. I don’t think his local car dealership give a monkeys whether he plays hurling, football or nothing. He’s already one of the best known faces around the county and not playing football for a year won’t change that!! is he training with squad? Stay away from the Indo, saw a headline “Mayo face another big test of character” and thought to myself “can only be that ape Brehony” coming out with a nonsensical headline like that. And sure enough it is him, haven’t read it and wont. I’m off him and Joe Brolly a good while now and its done my bloodpressure the world of good. Only disappointing thing is that I had to click the article to see who wrote it so he’ll probably get a bonus click for that. Click bait lads, don’t do it! Can’t recall in recent times a more muted build-up to a Mayo Dublin match. Is it really worth my while travelling home for this? Will there be anyone in McHale Park if I do decide to go? I have a feeling Tom Parsons will either be slotted in before throw-in or early on. Don’t tell me that team cannot at least be competitive. Let’s hope to see us defend like our lives depend on it in the first half, keep within touching distance and make a serious break for it in the second. None of this out of sight after 20 minutes like we saw last year and in 2015. We’ve had enough possession over the last two games to have won them all. Let’s make it count this time. East Cork Exile, my mental health has improved immeasurably since I stopped reading Brolly, Breheny, McGee et al and stopped listening to Tom Carr on the radio AND stopped watching the Sunday Game. At push I’ll watch a bit of live coverage but with the sound turned down so there’s no having to suffer Ger Canning. Thankfully we exist in an era where there are many excellent sports writers and broadcasters so I don’t feel too deprived. Ultair, if that’s the midfield pairing that start against the dubs you’ll wish you did stay at home. Both got cleaned for pace against Kerry, Fenton and co would burn them. The starting point against the dubs has to be pace, they’re experts at exposing any lack of pace, anywhere on the pitch. In C’bar a few years ago Cooper caused havoc from corner back where his marker wouldn’t or couldn’t track his runs. Puckout, bar putting in Tom Parsons I don’t see what other options we have for midfield at the moment. I picked the above on the basis that Aidan O’Shea will drop back to contest kick-outs and Barry Moran will drive forward at times. Gibbons was poor against the Dubs last year yes, but he’s probably done enough this year to at least start on Saturday. It’s inevitable that we will be burned for pace all over the field which is why it’s important we provide more than enough cover at the back. Look, If we see a few good passages of play from Mayo on Saturday I’ll be happy. Its a daunting task playing this Dublin team with the players we have available / unavailable. If there are a few good things that happen for us Saturday that’s all we can ask for. If these lads can somehow manage to keep the game reasonably close it might worry Dublin a bit knowing how many of the Mayo big guns are out. The main thing is that we don’t suffer any injuries. We’ll need to be adding to the team for the remaining of the league not losing more players to injuries / suspensions. And similarly on mental health Anne Marie, never ever ever read the twitter comments underneath any sort of article even half praising Mayo. you will knock a couple of years off your life if you do. The amount of apes who follow Dublin is incredible, there is an underbelly of them, who I’m convinced are all soccer fans who have just jumped on the Dublin bandwagon in recent times and will be gone again if the success ever ends, who are so outraged that mayo have had the temerity to put it up to them in recent years that it actually seems to be completely clouding over the fact that they have won Sam 3 years in a row! Its some sort of clinical psychosis at this stage. That is the best summation I’ve read on a cohort of the Dublin fans. They seem to believe that any recognition of Mayo somehow takes away from their success. Read any of the comments under a Ewan MacKenna piece and they’ll usually begin with “I haven’t read this but”.They despise him with a vengence because he’s not buying into the Herald/RTE mantra of the Corinthian supermen. They despise “Off the Ball” because the lads discuss their advantages. Mention their financial advantage and it’s “Mayo spend more than Dublin”, displaying a complete ignorance to the fact we spend more because we have to travel. None of this takes away from the fact that they are a brilliant football team with an excellent manager, it’s just the facts. A journalist does an excellent piece of well researched work and contacts every county hurling and football team in the country to see how many they have working/studying in Dublin. What’s the reaction from the usual quarters of Dublin “supporters”, they reckon the journalist is making excuses for Mayo because he highlights we have 18 players in Dublin. They have such a sense of entitlement that they remind me of Donald Trump when he claimed he was a self made man and started off with a “small loan of a million dollars” from Daddy. Try and engage any of the idiots in a discussion about Dublins financial doping and they’ll deflect, abuse or outright ignore you. It’s a good job that they have so many genuine supporters who outweigh the clowns. Agree with the last 2 posts but some Mayo fans don’t help the situation by responding to those Facebook/Twitter trolls. Well said Liam. It’s great that they hate Mayo, and long may it last. There’s some good things about tomorrow nights game like the fact that the dubs are taken out of dublin and will face a team that doesn’t respect them like the others do, plus it’ll be a very cold night in MacHale Park so every hit will be felt that bit more. I’d leave the immersion off in the dressing room as an added bonus for them and refuse the fans a drink in the pub if they don’t say “ please” “ thank you” and “ certainly sir, I’ll get up and give you my barstool”. Also, not to drag out the point but surely Mayo GAA should start banning the yobs commenting on their page. It’s fairly easy to spot who the trolls are. well certainly you cant engage with them, theres no point so don’t trouble yourself. Actually, someone mentioned trump and its a lot like that in the trump supporters V the rest in the US as well isn’t it. Anything showing him in a bad light must be #fakenews or a conspiracy drummed up by the opposition. People seem incapable of reasoned debates these days where I may not agree with your point or argument but I can acknowledge a good argument or point.